Hall Of Justus alumni Chaundon drops his sophomore follow up to 2008's Carnage. Chaundon's presence on countless albums and mixtapes has built a strong foundation and a growing following also thanks to his work with Little Brother and 9th Wonder. The Bronx New York native makes music that exudes power and originality which separates him from the pack, while maintaining potent lyricism, integrity, and his love for the Hip Hop culture. Chaundon became a member of the Justus League in 1999 while attending North Carolina Central University. After being surrounded by like minded individuals he has discovered his niche and came into his own to develop a solid career. 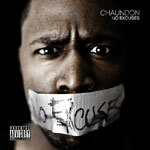 No Excuses contains the hottest production in Hip Hop from the like of producer Ill Mind, M-Phazes and D. K. The Punisher. The album also features vocals from Darien Brockington, Carlitta Durand, Bishop, Big Dho and Erica Thompson. Open copy played in our store. Near mint for disc, booklet and tray card. Jewel case very good except saw cut through edge and slight scuffing on the outer surfaces.